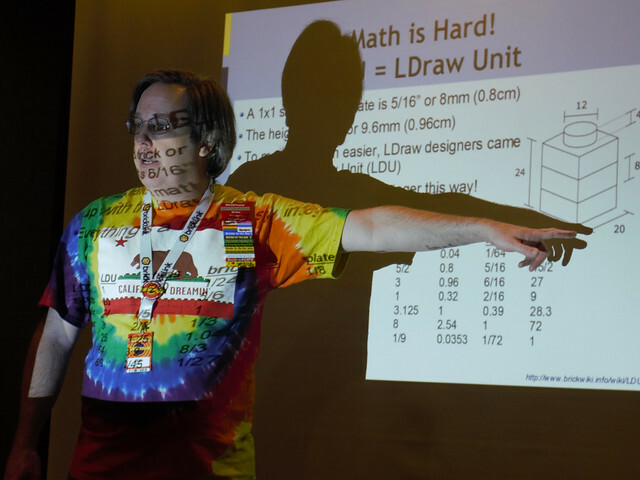 As I posted yesterday, I gave two talks at the convention, Brick Geometry and Studs on All Sides (aka Studs in All Directions). I also participated in some games such as speed builds and Dirty Brickster (similar to a white elephant gift exchange), and exhibited a number of models. I was thrilled to be selected for the Best Transportation trophy in the Town & Train section for my amusement park train! (I’ll be posting about the train in the next few days.) My final version of my other newest model, the Short C-23 Sherpa Smokejumper was also on display. Having been through the experience of running the convention for six years, and then sitting back and watching others do the work I used to do, facing the same challenges etc., I really wanted to jump in and offer advice/help, but I know that’s not the right thing to do… it would be the equivalent of back-seat driving (which anyone who’s ever driven me around will attest, is also something I have trouble not doing). But I did my best to keep my opinions to myself, and I was incredibly happy to see that the people doing the work I used to do were doing an excellent job – and truth be told, overall a better job than I would’ve likely done. And to all the directors, staff, and volunteers of Bricks by the Bay, I say: Keep up the good work and I can’t wait for next year. I took over 600 photos of the MOCs (“My Own Creations”) on display at the event, and you can view those photos on Flickr. There were many very impressive creations on display and I am feeling inspired to build more than I have in years! 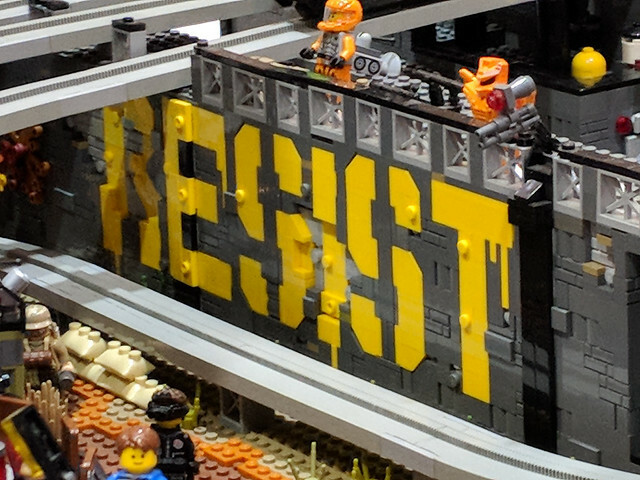 The photo above is one of my favorites, a spray-painted “RESIST” on a dystopian MOC. Thanks! I try to be thorough, even the Bionicles!